If you’re shopping for DGT products, you obviously seek out the very best! 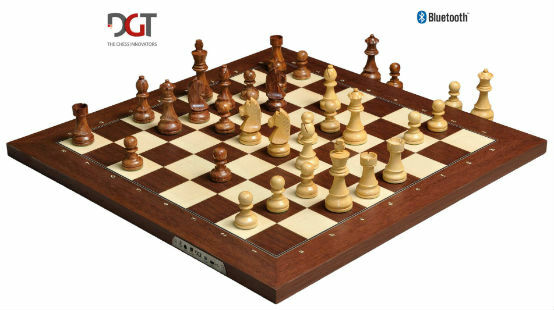 Read on to compare and select the right DGT chessboard for you! 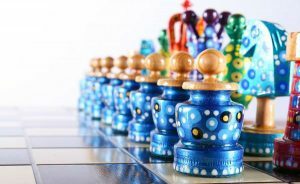 DGT (Digital Game Technology) is the industry leader in making the very best electronic chess sets and other digital chess products (chess clocks, chess computer software, etc.) for a wide range of budgets and needs. From the truly astounding Revelation II – the most powerful and feature-laden electronic chess set ever made, to exceptional-quality USB and Bluetooth-ready chess sets that bring your PC chess software games to life, to the no-frills Smart Board, for the player on a budget who only needs the basics – there’s a DGT chess board (or combination) for you! 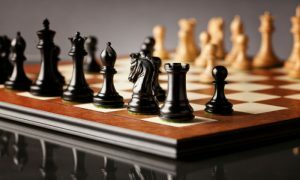 We’ve reviewed DGT’s top chess board options (the Revelation II, the DGT Electronic Chess Board, and the Smart Board), to bring you all the information you’ll need to select the perfect chess set for your needs! All of DGT’s products are backed with a warranty and exceptional tech support, should you ever encounter any difficulty. All DGT product manuals can be easily accessed on their website, which also features a helpful FAQ section for each product type. The DGT Revelation II is the best and strongest chess board DGT has ever created – not to mention, the strongest electronic chess board in the world! The Revelation II is well-worth every penny for its impressive array of capabilities, plus, it’s absolutely beautiful. One of the Revelation II’s standout features is that this e-board also houses an extremely powerful chess computer – making it possible to play electronic chess games without having to connect to a PC or other device (though it is capable of doing so if you desire). The integrated chess system was developed by DGT and Phoenix Chess Systems in the Netherlands. DGT Revelation II – The strongest electronic chess board in the world! 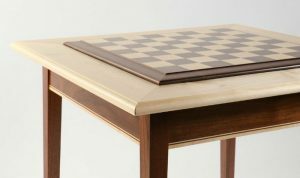 The Revelation II is tournament-sized (26.4” x 24” board with 2” squares) and can both broadcast and play chess games over the internet. This board has individual piece recognition technology and inlaid LED lights to display moves as you play. The green OLED display screen is extremely user-friendly and the menu can be displayed in English, French, German, Dutch, or Spanish. The Revelation II comes equipped with a variety of incredibly strong chess programs, both commercial and freeware. 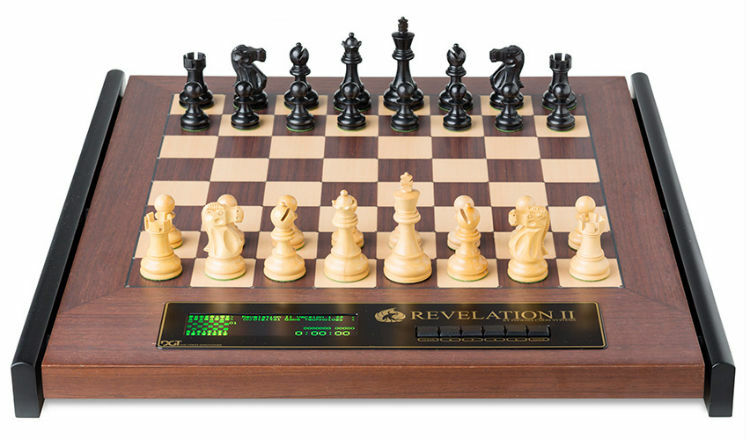 You can rest assured that technology will not outpace this set, as forthcoming upgrades to the programs and system are downloadable directly from Revelation’s website at any time – protecting your investment in this exceptional DGT chess set. The Revelation II comes with a set of beautiful wooden chess pieces, but if you prefer a different design, DGT offers compatible chess pieces in several different styles. A canvas carrying case is also included with the purchase of this chess set. Other extras you can add to customize your Revelation II include DGT’s retro emulation software. This software lets you enjoy the nostalgic feel of playing on an original 1980s or 1990s chess computer while retaining the Revelation II’s exceptional level of power and accuracy. The Revelation II is pretty much impossible to top! It’s a powerful all-in-one chess computer that’s also beautiful enough to set out on display in your home. DGT’s flagship chess board is the best-selling e-board in the world. And it’s not hard to see why! The DGT electronic chess board is excellent for tournament play and has an impressive array of features – many of the same that the Revelation II has. 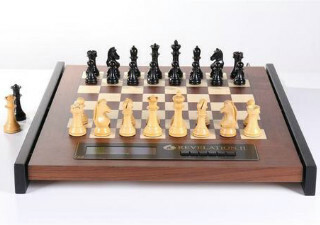 The primary difference between this board and the Revelation II is that the DGT electronic chess board does not have an internal chess computer, so it must be used with either a PC chess program or The DGT Pi Chess Computer (sold separately). 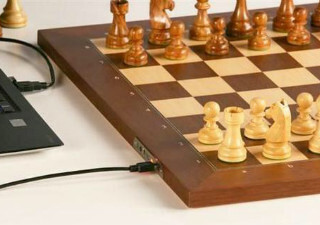 There are two versions available of this DGT chess board, one that connects to a PC via USB and one that can connect via wireless Bluetooth technology. 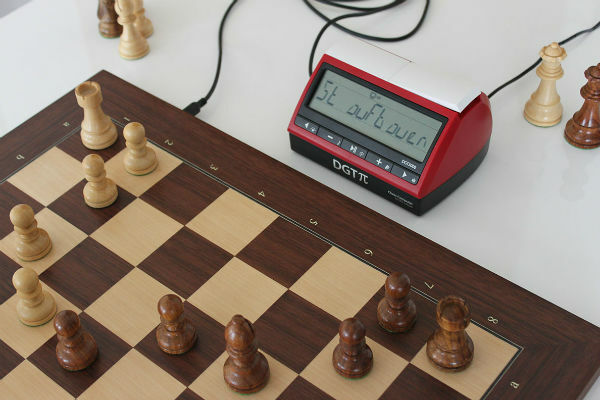 The DGT electronic chess board allows you to broadcast tournament games online, can store games in the board’s memory for later retrieval (up to 500 moves), and can analyze moves when you are playing against a human opponent. The sensor technology in this set is exceptionally fast (6 scans per second) and accurate. The DGT e-board is compatible with the following chess software, with more new programs frequently added: World Chess Network, all ChessBase programs, Pocket Grandmaster 2.0, all versions of Arena, Internet Chess Club (BlitzIn), US Chess Live, Chess Assistant, PlayChess, and DGT’s own tournament broadcasting program, TOMA. 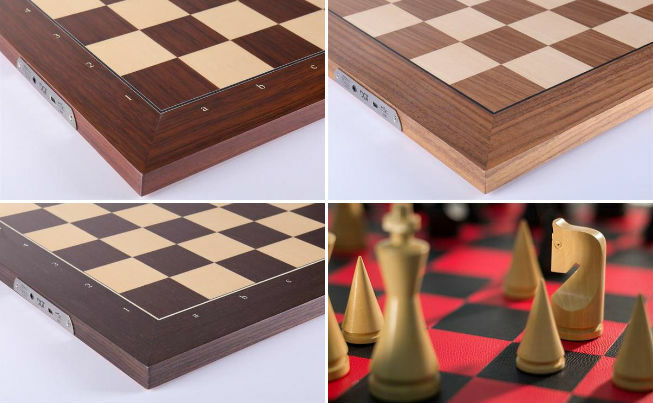 The DGT Electronic Chessboard is made out of Rosewood, Walnut & Maple, Wenge or Leather. 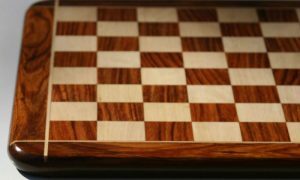 This elegant DGT chess board is made in Holland and Spain, out of beautiful rosewood, wenge, or maple and walnut. There is also a limited-edition leather chess board option. Both the USB and Bluetooth versions of the e-board come with a one-year warranty, driver CD, USB cord, 24-hours full-play rechargeable Li-ion battery, and 3-color LED status indicator. A firmware upgrade feature makes it easy to install future software enhancements or new functions. Both the USB and Bluetooth DGT chess boards are the same size and weight. The board measures 21.25” with official FIDE tournament-sized squares (2.25” or 5.5 cm). The board is .75” (1.8 cm) thick, the same as a typical chess board. There are five different Staunton wooden chess piece style options available with this chess set, each with a 3.75” king and extra queens. The DGT electronic chess board also fits perfectly in DGT’s attractive custom canvas carrying cases, available in red or black. The DGT Smart Board is a simpler option, specifically designed to make the electronic chess board experience accessible to those with smaller budgets. The main difference between the DGT Smart Board and the other DGT chess boards is that the DGT Smart Board only includes one chess program. It is also made of “wood-look” plastic, not actual wood. This DGT chess board is smaller, thinner, and more lightweight, making it easy to travel with. In its simplicity, the DGT Smart Board is very energy-efficient and scans quickly. 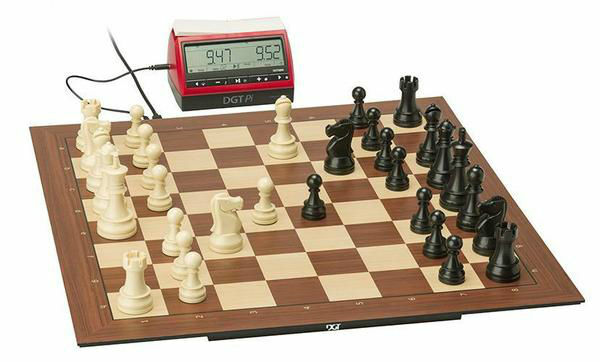 The Smart Board is compatible with any DGT chess pieces, wood or plastic, and any of the DGT add-ons, such as the DGT Pi chess computer, can be purchased to enhance the Smart Board. The DGT Smart Board measures 52 cm (20.5 in) with 55 mm (2.16 in) squares. It interfaces with Windows OS (Windows emulation software is required to pair this board with a Mac). This chess board can be used with your PC or laptop chess software and it can record your games to review later on. The Smart Board is fully compatible with all other existing DGT chess boards in a tournament setting. You can broadcast Smart Board tournament games live on your website with free LiveChess software and cloud service. This DGT board can do more when it is used with The DGT Pi Computer, a chess clock/computer combination that turns any DGT chess board into a powerful chess computer. With DGT Pi, the Smart Board can become a virtual opponent to play against. The DGT Pi will automatically store your games, and you can save them online in Fritz by ChessBase (access is included with the purchase of the DGT Smart Board). 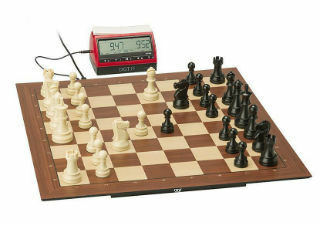 You can also use the Smart Board with DGT Pi or the DGT3000 chess clock to connect to PlayChess.com to play against people all over the world. The DGT Smart Board can be purchased as a full chess set or the chess board can be purchased on its own. 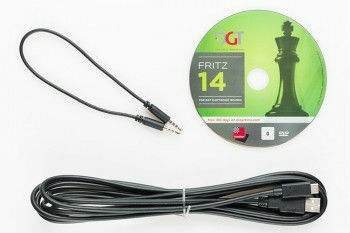 With or without the chess pieces, the DGT Smart Board includes a USB cable, DVD with drivers, DGT LiveChess software, ChessBase Fritz 14 chess play software, and 100 days of access to PlayChess.com Premium. DGT (Digital Game Technology) is the world’s leading company for electronic chess products. DGT’s exceptional-quality products are currently used at all of the world’s biggest chess tournaments and events. 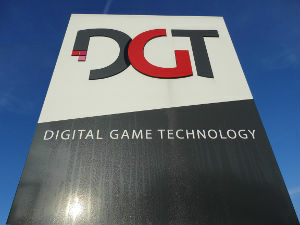 DGT started out as “DGT Products” when it was founded in 1992 by Albert Vasse and Brian Bulsnik, creator of the first prototype digital chess clock. They continued to run the company (whose name was shortened simply to “DGT” in 2007) until selling it in 2015. DGT does not venture into the world of crafting “regular” chess boards (non-electronic), Instead, their focus and expertise remain solidly in the world of digital chess. Following the successful release of their initial digital chess clock, DGT gravitated toward the natural next step, figuring out how to make electronic chess boards. The technology was still brand-new at the time, but DGT was determined to get it right. DGT got their opportunity when FIDE (the International Chess Federation) expressed interest in having electronic tournament boards for the 1998 World Chess Olympiad. DGT’s goal was to have 300 wooden electronic chess boards broadcasting and saving a record of all the Olympiad games on one shared network. Achieving this was a challenging process with many bugs to work out, but DGT pulled it off. At the Olympiad, a network of 328 DGT chess sets was up and running perfectly. Since then, nearly all major tournaments have been using DGT chess boards to broadcast their chess games over the internet. Another major contribution DGT has made to the world of chess tournaments was the launch of LiveChess, a software for tournament chess play. In 2017, this software was completely overhauled and upgraded, making access to online chess tournament broadcasting easy and available to many more smaller clubs and organizations, via the free DGT LiveChessCloud. 2017 is also the year that DGT released their Smart Board, a high-quality plastic e-board designed to make electronic chess play accessible to those shopping on a smaller budget. While they were perfecting their boards for tournament play, DGT was also hard at work discerning the best ways to make their chess boards useable for computer chess play at home. Their USB and Bluetooth-enabled e-boards are compatible with most of the major commercial chess engines, as well as many non-commercial open source chess software, websites, and chess apps. 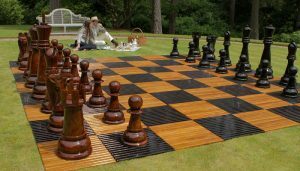 We confidently recommend all of DGT’s chess boards and chess accessories. 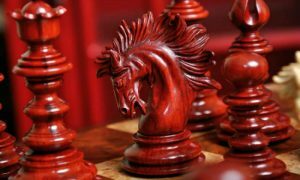 From the craftsmanship of the beautiful wooden chess pieces to the powerful chess computer software options, DGT chess boards are well worth the investment. It’s also worth taking the time to assess your electronic chess set needs, so you can get the most out of your DGT chess set! If you opt for a set other than Revelation II, be sure to read up on options like the DGT Pi chess computer, to make sure you’ll still have all the features and functionality you desire. 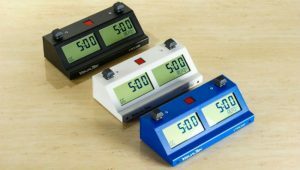 To learn more about electronic chess boards and see an even wider selection of electronic chess products, please check out our Electronic Chess Boards Buyer’s Guide.